Projects in their essence are completed by an assembly of contributors who each complete their effort, and then pass their deliverables on to the next contributor. Of course, projects are more complex. 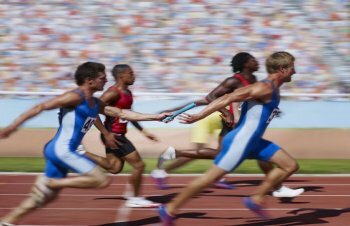 While a relay race involves athletes running one after another, projects typically have multiple contributors running at the same time, each of whom may require making several important hand-offs to other key players. As projects grow, so too does the number of contributors, and the total number of project hand-offs grows exponentially. Projects typically involve hundreds or thousands of hand-offs (or interfaces) from one party to another through the course of the project. Mega-projects can involve millions of hand-offs. It is easy to understand then, why special attention to interfaces becomes critically important to the success of major projects. Dropping hand-offs routinely adds unintended risk and waste to the project. Dropping key hand-offs can be very expensive and cause significant delays. Dropping key hand-offs routinely is usually disastrous. Many standard interfaces are well understood and regularly practiced. Engineer-to-designer-to-supervisor, or iron worker-to-welder-to-foreman for example. But others, such as engineering-to-procurement-to-supplier or supplier-to-operations, happen less frequently, and are therefore, less understood. These involve people who don’t typically work together, or know one another. These are the hand-offs that need to be defined, communicated and practiced. Interface Management is a process by which all important hand-offs (those that are most prone to problems and/or that could pose the most risk to the project) are defined, communicated and tracked. It involves dialogue between each of the key participants, and answers the questions of why, what, when, where, who and how the hand-off will occur. Although the effort sometimes seems obvious and unnecessary, on large and mega-projects it eliminates the chance for error and reduces one of the major risks for delays and overruns. Identify the key organizations and teams in your project. Have each team identify and document the key or critical inputs and outputs of their effort. This should include the important assumptions, deliverables, materials, tools and knowledge that is critical for their effort; as well as the deliverables and materials they will supply to the next team. Have each team evaluate their inputs from the previous team to ensure they understand what they will receive and to ensure that it meets their expectations and needs. Resolve any differences between each of the teams. Document each key input/output and have both parties sign off a specification with the details of each. Track, monitor and regularly update progress of the hand-offs so there is continuous management attention. There are several formal tools and systems advertising the ability to help document and manage project interfaces. But nothing is more important than executive management oversight. The leadership team must insist on hand-offs being documented and tracked. Without consistent, high level attention, project interfaces are usually ignored or dismissed as ‘obvious’; and too often projects suffer the consequences of delays and overruns. When relay race teams train hard and practice to hand-off the baton smoothly during the race, they increase their chances of winning. So too, strong project teams whose participants have talked through and understand what they will receive, and hand-off to the next contributor, increase their opportunity for project success. As the old saying goes, “practice makes perfect”.